In the world of backcountry hunting, modularity and versatility are king. Seek Outside built the Lil’ Bug Out shelter, or LBO for short, to be modular, versatile, and above all else, light-weight. 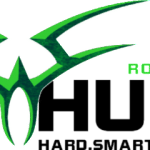 The LBO has so many set up options that it can be a little confusing at first glance to figure out which configuration best suits your hunting style. In addition to the seemingly endless modular configurations, the LBO can also be adjusted to increase airflow during the summer months or buckled down with a lower pitch to withstand a fierce breeze in the winter or pitched higher for additional headroom. The LBO shelter system consists of the floor-less LBO base, two vestibule options (2-piece or new larger 3-piece vestibule), and an accessory tarp. The base alone is a three sided shelter that covers 43 square feet and weighs in at 16 ounces. You can pair the LBO base with either vestibule, another LBO base, or with the connector tarp and another base or vestibule to “build” a tent that’s right-sized for any occasion. Let’s take a closer look at some of the applications for the Lil’ Bug Out from Seek Outside! The base provides just enough room for two to sleep overnight, but there won’t be much room to spare. For my size (6’5”, 225 lb.) the base shelter is not quite big enough for me to comfortably use as a 2-man shelter. 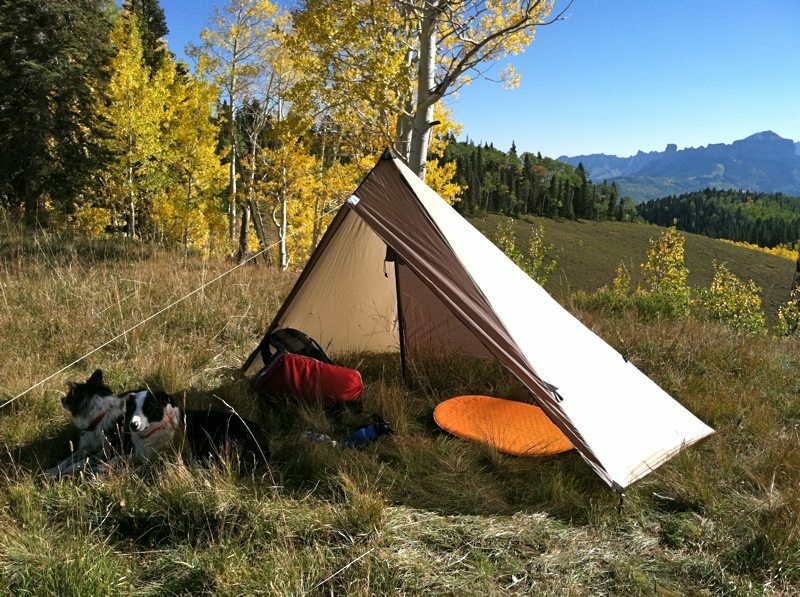 However, for light and quick, solo bivy-hunts, it functions perfectly. The optional sod skirt can be added for colder/windy conditions and optional “nests” made of no-see-um mesh can be used to keep bugs out of your sleeping quarters to provide similar comfort to a double walled tent in a lighter package. When compared to a standard run of the mill tarp the LBO Base has one outstanding feature. The zippers allow it to be pitched as either an enclosed or open shelter. For me, the weight penalty of zippers is worth the ability to close the doors and keep all of the weather out when sudden changes occur on the mountain or when you know afternoon weather may be just over the horizon. Sometimes it’s necessary to stay put and keep tabs on an animal rather than return to base camp. The LBO base is lightweight and packs small enough to keep with you at all times so you can camp wherever you end up. 6 stakes are necessary when planning to run a guy-line off the “beak” (overhanging eve) for stability. The guy lines are not included, so bring your own para-cord or preferred guy line material. This is the set up I use most often for 2-man, and solo trips. It can cover a variety of needs, especially with a stove jack installed. For a solo trip, this shelter is a castle at roughly 86 square feet. For short 2-man trips there is plenty of space for gear inside. 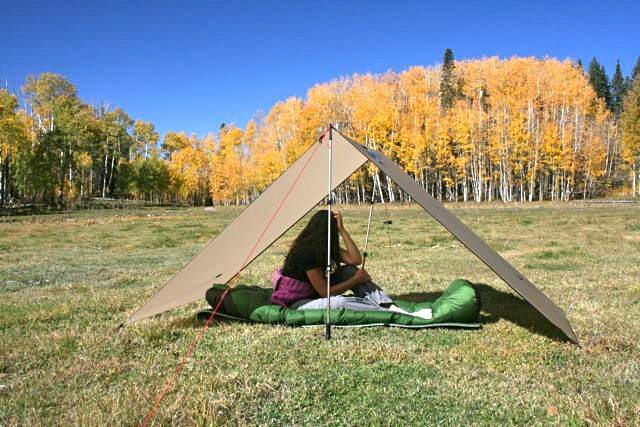 On longer 2-man trips where more gear is needed it can be a little tight but the lightweight connector tarp can be spliced in to increase square footage to a whopping 130 sf! Dual doors make it easy to achieve good airflow and two exits makes it easier to get in and out without having to trip over your buddy. One general weakness of the LBO system during the spring and summer seasons is the lack of bug screens. This can be mitigated with the use of the optional nest(s) in one side or both, but bug protection is still only available in the sleeping area. For winter use a stove jack can be installed at the peak. In windy conditions 8 stakes are required for this setup, but 6 stakes will work in mild conditions for the ounce counter. Base + Vestibule: 56 sf, 24 oz. The Base + Vestibule set up is similar to the Base + Base although interior space is somewhat smaller at 56 sq feet. Solo trips would be my preference in this configuration, but two hunters without gear inside will fit. If I am with my wife on a summer overnight fishing trip this arrangement is perfect. One notable feature is that the Base has an eve or “beak” facing the front below the peak. The 8 inch overhang offered by the beak protects the zippers in wet weather. Simply guy out the base over the top of the vestibule and your zippers are protected from any water draining down them. Guying out the beak also adds stability in windy conditions. To set up the Base + Vestibule requires 6 stakes, and one pole. In warm weather conditions when 2 people want to spread out a bit, keep their gear inside, and still have a little extra space, this set up is a good option. When additional air flow is desirable open up one side of the tarp or simply lift the bottom of the base as shown in the photo below. A stove can be used in the middle of the tarp to warm the tent effectively when the temps outside start to drop. Base + Tarp + Base (BTB): 130 sf, 48 oz. This is the largest configuration for the LBO and can accommodate three people and gear easily. It can also be comfortably used as a 4-man if some of the gear is stored outside. The floor space is similar to my Seek Outside 6-man tipi, with a couple of clear distinctions. First, a flat sided shelter such as this makes it easier to get closer to the wall with the sleeping bag and pad without getting condensation all over the sleep system. That alone makes the interior space more efficient and comfortable for sleeping arrangements. To some this may seem like a small detail, but the primary role of any shelter is comfortable sleep. Placement of every individual matters, especially in a single wall shelter where bumping into a wall that may be wet with condensation during the night is best avoided. Being able to sleep closer to the wall changes the way I store gear in the LBO shelter compared to a tipi. I typically store gear like a rifle and binoculars next to the wall in the “dead space” of a tipi where a foot or more of space between the sleeping bag and the wall is necessary. In the LBO only 6 inches of clearance is needed so there isn’t much “dead space” for gear storage around the outside. The loss of that gear storage space adds up when 4 people call the LBO home with a stove in the center. 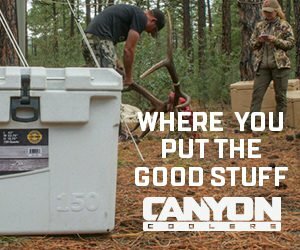 Gear stored in the middle of the tent adds too much clutter, so plan on storing packs and other bulky things outside when you have the BTB booked full of hunters. For winter camping the BTB is cozy with the stove jack in the central tarp heating the entire shelter from the middle. There is enough space to hang & dry clothes, and eat indoors. This is far and away the best feature of any shelter that uses a wood burning stove and venting is easy with 4 places to lower the zippers. The biggest challenge with the long, rectangular footprint of the BTB is finding enough level real estate to pitch it so that gaps where the tarp meets the ground can be eliminated. The gaps aren’t an issue in the bases when a nest is used, but will require some planning when it comes to placement of the tarp. 10 stakes are required as well as two poles for the BTB setup. With all of the pieces it’s wise to split the load between partners when preparing to use the shelter in this configuration. Base + Tarp + Vestibule: 38 oz. This set up is very similar to the BTB, so not much time will be spent explaining it. Simply substitute one of the bases with the Vestibule and you have it. It offers less floor space than the BTB, but most of the considerations are the same. The BTV arrangement is most comfortable as a 2 or 3 man shelter but 3 people with gear will be a tight fit. With a stove the BTV is best as a 2-man shelter. This is a 2 pole set up requiring 8 stakes, and possibly nine if you chose to guy out the vestibule. Tarp + Vestibule: 22 oz. The tarp and vestibule set up is similar to what many companies offer with their tarps. The major difference is that the closed end can be attached or detached depending on preferences. This would primarily be a light and fast option or an ideal emergency bivy. The possibility is also there to add a second vestibule to the other end and make it completely enclosed. This is similar to the pup style tent that my Dad grew up using in boy scouts, except it’s taller and offers much more interior space. This is an ideal overnight shelter that requires 6 stakes and two poles. The tarp alone is just that, a rectangular piece of waterproof silnylon material that can be used with poles and guy-outs or guy-outs alone in a variety of tarp pitches. The only disadvantage to this tarp is the minor weight added by the zipper attachment points. The advantage is that you own it as part of the versatile LBO system rather than having to own an entirely separate tarp style shelter to fill this role. The LBO compresses down to fit in just about any pack. You can see that a full Base + Tarp + Base as well as a nest (shown above) could easily fit in the bottom of the 2300 ci Dragon Slayer from Mystery Ranch. The stuff sacks are attached to the bases along the bottom by the door. They are sewn big enough to add other parts of the LBO making it easy to combine whatever configuration is desired. Seek Outside sells accessory poles made specifically for the LBO if you don’t want to use trekking poles. Seek Outside is now offering the 3 piece vestibule (10 ounces) which offers more space than the original 2-part vestibule. Paired with the Base, the 3 piece vestibule (74 sf & 26 oz.) is lighter than the Base + Base configuration (32 oz. and 86 sf). I have personally not used it yet, but will in the near future. Other LBO related products and design refinements like vents in the bases are coming in the near future so keep an eye on the Seek Outside website for more information on new and existing products. 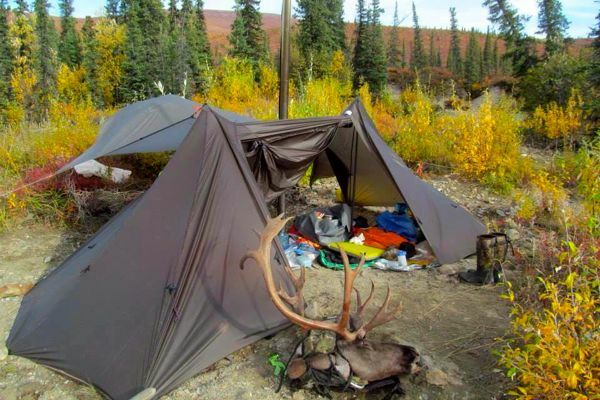 All in all, the Lil’ Bug Out is a great shelter system with dizzying versatility to meet just about any hunter’s needs.